Jack Turner, sometimes billed as the "Singing River Boy," was a country singer from Alabama with a string of singles during the 1950s. Not to be confused either with "Happy" Jack Turner (a piano player and Decca recording artist of the 1920s and 1930s) nor "Hobo" Jack Turner, Jack Turner is also known for penning the minor rockabilly classic "Everybody's Rockin' But Me." Jack Turner was born on June 10, 1921, and hailed from Haleyville, Alabama. His father S.W. Turner worked for the I.C.Railroad and his mother presented Turner with an ukulele when he was seven years old. By then, Turner had already made his first public appearance at a school event a year earlier. Music became one of his main interests and eventually he also mastered the guitar, so he could back up local fiddlers at dances. Another of Turner's interests was painting and drawing. He was so good at it, that he decided upon a career in art and after finishing high school, Turner enrolled at an advertiging art school in Nashville, Tennessee. 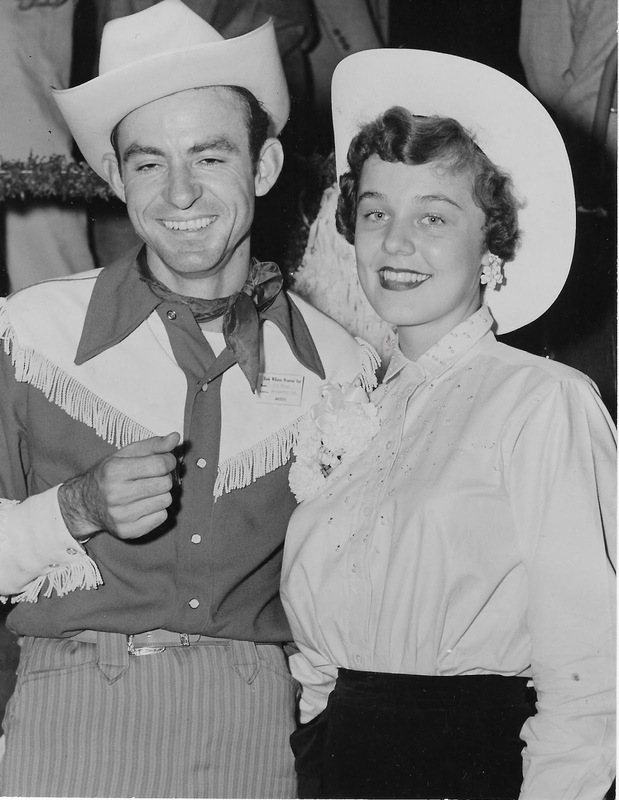 However, music was still on his mind and not surprisingly, he attended one of the Grand Ole Opry shows while in Nashville. Early in 1942, he met his future wife Lorene Davidson. That same year, he was drafted into the US Navy. While serving his country, Turner founded a country band and entertained the troops during this time. After his discharge, he moved his family (which included two daughters by then) back to Alabama and settled in Montgomery. He got a job as an artist-illustrator at the Air University at Maxwell Air Force Base and besides that, also worked as a musician. When WCOV-TV started out, Turner auditioned for the station and was immidiately engaged as a cast member of a Saturday night TV show, "Bar Twenty." When Shorty Sullivan started his "Deep South Jamboree," a live stage show airing on WBAM, Turner became a member of the show right from the start and stayed with it for several years. Around the same time, he was discovered by Hank Williams' mother, who also lived in Montgomery and, being impressed by Turner's talent, recommended him to Fred Rose in Nashville. Turner signed a recording contract with RCA-Victor in 1954 and held his first session for the label on February 17 that year. Contrary to a widely held belief, two 1953 RCA discs issued as by "Jack Turner and his Granger County Gang" featuring the incredible great covers of "Hound Dog" (RCA-Victor #47-5267) and "Gambler's Guitar" (RCA-Victor #47-5384) were not by Turner but by the country comedy duo of Homer & Jethro, hiding under a pseudonym. Turner's first session produced "Shoot, I Reckon I Love You" and "Walkin' a Chalk Line," both were used by RCA for his debut disc (RCA-Victor #47-5682 and #20-5682, 78rpm and 45rpm formats respectively). Two other songs, "Model T Baby" and "Hichhikin' a Ride" were two of his best performances but held back by the label for a year. Two more sessions for RCA followed ca. in June 1954 and in May 1955. Turner's second release from August 1954, "If I Could Only Win Your Fall," became a minor hit and got a lot of airplay back then. Although it seemed he was on the right track, chart success eluded the disc. It was, however, a first success for Turner that caused RCA-Victor to continue the collaboration. A newspaper clipping from around 1954 also indicated that Turner was designated to appear in a movie about Hank Williams life. Apperently, he was was chosen to take over the role of Williams, as the newspaper relied on journalist Walter Winchell. However, there are no hints this movie ever came into production. The first movie about Williams was filmed about ten years later with George Hamilton IV starring. 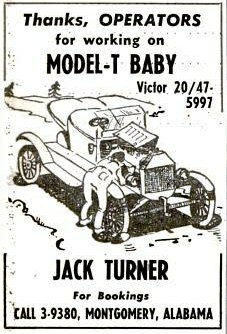 RCA-Victor initiated a special promotion campaign around "Model T Baby" (RCA-Victor #47-5997 and #20-5997) which was released early in 1955 by the label, to push the record. Billboard reported on May 14, 1955: "[...] Myrna Holly, freshman at the University of Mississippi, was last week declared the winner of Turner's 'Model T Baby' Contest inaugurated several months ago to plug Turner's record by that name. Jimmy Swan, of WHSY of Hattiesburg, Miss., sent in the winning entry. As winners, both will have their portraits painted by Turner." Turner recorded with some of the best studio musicians that Nashville had at that time and despite fine recordings, that certain hit record wouldn't roll along with RCA. After a total of six discs released on the label (the last one in November 1955), the company dropped Turner from its roster. However, Turner had built himself quite a following, especially in Alabama. He started two new shows on his own, besides his regular performances on the Deep South Jamboree. On June 6, 1955, the first episode of his half-hour long "Jack Turner Show" aired on WFSA-TV in Montgomery. One June 14, Turner also started another TV show, the "Alabama Jubilee" on the same station. The shows featured his regular band, the Singing River Boys, which included Jimmy Porter on steel guitar. Also appearing with him on TV was his daughter Dixie at times. On October 22, 1955, Jack Turner and his band were part of a "mammoth free show, highlighting Alabama c&w groups," as Billboard reported on November 12. The show was headed by the Duke of Paducah, Whitey Ford. Several more popular Alabama country groups were part of that show, which was held at the City Auditorium in Birmingham and drew 5.300 people to the auditorium and another 1.500 hearing the show from outside the building over loudspeakers. Although Turner's homebase remained Montgomery, he nevertheless held his ties to Nashville and signed a new recording contract with Hickory Records in May 1956. Already on April 12, he had recorded a session for the label featuring Turner on vocals, Chet Atkins on lead guitar, Ray Edenton on rhythm guitar, Jimmy Day on steel guitar, Dale Potter on fiddle, Marvin Hughes on piano, and Ernie Netwon on bass. The session yielded "Lookin' for Love," "Everybody's Rockin' But Me," "I'm Gonna Get You If I Can," and "It's My Foolish Pride." It was especially "Everybody's Rockin' But Me" (Hickory #45-1050) that gained some exposure. Released in May 1956 on Hickory, the anti-rockabilly statement caught the attention of Columbia Records and Bobby Lord, who turned it into a hard-driving rockabilly piece on June 28 with a great lead guitar by Grady Martin. Hickory released a second disc by Turner in November 1956 but success eluded it, hence it remained his only session for the label. Turner changed labels one more time in 1957 and cut one session for MGM on November 25 at the Bradley Film and Recording Studio in Nashville. Two singles were released, the first already in December 1957. While he had declared in April '56 "Well I don't rock like crazy, I'm just a country man" in "Everybody's Rockin' But Me," Turner certainly had a rocking approach on "Shake My Hand (Meet Mr. Blues)," released by MGM in July 1958 (MGM #K12690). In 1957, Turner starred in one of Arlene Francis' "Home" episodes, a NBC homestory TV show. The format, filmed in Turner's hometown Haleyville, featured interviews and railroad songs performed by Turner and his daughter Dixie. The episode aired on March 25, 1957. No more records appeared afterwards by Turner and Billboard ceased mentioning him or his shows. It seems, he turned his back on the music business, limiting his career to the 1950s. He nevertheless enjoyed fishing as well as painting and several of his artworks turned up in the Montgomery area. The themes for his drawings were mostly taken from the Alabama countryside, inlcuding old barns, creeks, and the cotton fields. Nevertheless, Turner also continued singing and entertained his family with his musical abilities, as his nephew Raymond Harris rememberred: "I miss listening to him pick his guitar and sing. He was a gifted entertainer. Had a great sense of humor." The passing date of Jack Turner has been a black spot for long. I first suspected his death date was August 22, 1997, as I found a cemetery entry of a certain H. Turner, Jr., born on June 9, 1921 (heed! ), buried in Montgomery, Alabama. I had also correspondance with a distant relative of Turner's but she couldn't remember his death date. Further contact with them fizzled out, unfortunately. But thanks to another visitor of this blog, it is determined Turned died in 1993, at Greenwood Cemetery in Montgomery. His birth name was Will Jack Turner. Thanks for the link, Alexander. But your article is far more complete and accurate than mine. Thanks to you and congratulations! Hell Alex, I didn't read the lat line of the feature and the link to Bob's soundfiles. Now everything is fine! He died in 1993, buried in Greenwood Cemetery in Montgomery. He's listed as Will Jack Turner. I believe I have some original artwork by Jack Turner done in Montgomery in the 1980’s. Does anyone know of a resource where I can have these verified and valued? Never did i care much about "one of those" Jack Turners, until i stumbled upon a copy of Nightmare / Little Boy Why Do You Weep, which i think is an incredibly genious double-sider for somebody who loves weird and minor key hillbilly boppers. Maybe i'm just as weird, but i think this one is totally underrated (i got it dirt cheap). Also it's good to know, that Jack was into arts as well. Thank you guys for gathering information on artists whose story might otherwise have remained untold! My grandfather and Jack were very good friends. I have several Jack Tuner pieces. I’d be happy to share the paintings via email.